cross between a pansy and a viola. I’ve put new in parenthesis because I’m not sure how new the plant actually is. There is reference to a Panola as far back as 2006. The originator of this particular cross seems to be PanAmerican Seed, a worldwide corporation whose web page states that they are “one of the world’s leading breeders and producers of F1 and open-pollinated flower seed”. According to the information on the plant, it was bred to have the flower size of the pansy and the hardiness of the viola. in our area (zone 5). 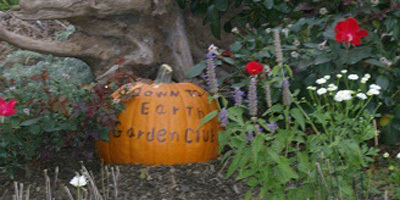 (Yes, they are now including us in zone 6 but tell that to my dead perennials. But I digress from my digression.) Some of the fancier violas are not quite so hardy. I grew a viola called “Jolly Joker” for several years and also a small nameless black viola but both eventually disappeared during colder winters. Currently, I have another black viola. This one doesn’t seem to over winter but it is reseeding itself around the pot in which it was grown. The larger pansies sometimes overwinter. Again, some are hardier than others. The violet/purple shades seem to be the hardiest with the orange ones nearly impossible to over winter. It is possible to establish a reseeding pansy patch that will last for years, as the hardiest survive to reseed and the less hardy die out. I’ve had pansies in one of these colonies blooming in January, so the plants themselves overwintered and the continuation of the colony wasn’t due to reseeding. But back to Panola. The flowers are not quite as large as the fancier pansies but much larger than violas. They have the prolific flowering habit of the viola and should be more adaptable to cold winters than pansies. They are guaranteed to temperatures of to -10° F. Panolas are allegedly capable of flowering most of the growing season if you pinch off the spent flowers to prevent them from setting seed. These are F1 hybrids. The seed they produce will not breed true so there is no point in letting them go to seed unless you don’t care what your pansies look like next year. They should not succumb to the higher temperatures of summer as do pansies but should do well throughout the entire growing season. The plants themselves are similar to a pansy at 6 to 8 inches in height with the leaf shape of a pansy rather than the more heart shaped leaf of a viola. The spread is 8-10 inches. 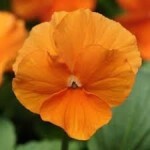 The flowering stem is short so it will hold the flower upright better than longer stemmed pansies in wind and rain. The flowers last from 5-7 days. We were told by the nursery man at Country Farm & Home Gift and Garden Center that the yellow ones are the most floriferous. blotched. . Clear panola colors include: deep orange, purple, scarlet, true blue, white and yellow. Blotched varieties have more fanciful names. ‘Beaconsfield’ is a purple/white combination. ‘Deep Blue Blotch’ is a dark purple on purple. ‘Fire’ is a red/yellow as is ‘Sunburst’ although the markings are different. ‘Rose Picotee’ is a rose/yellow pattern. ‘Marina is light purple’ and white and very similar in pattern to ‘Purple Face’, which is a dark purple/white combination. ‘White Blotch’ is white with a dark purple center and ‘Yellow Blotch’ is yellow with a dark purple center. All are very attractive. 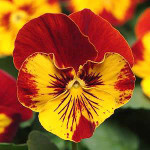 Panolas grow under the same conditions as do pansies and violas. 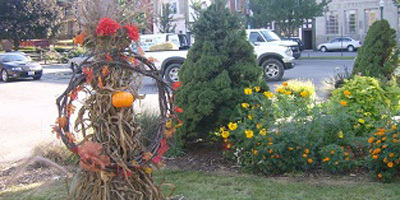 They are cool weather plants and flower best in the spring and fall. They like soil rich in organic matter that is moist but well drained. Pansies like lots of water but will succumb to wet feet especially in the winter and early spring. They will reseed and grow well in in mulch. They don’t root deeply and seem to like the loose composition of wood mulch. not overwinter. Choose short, healthy plants. A taller plant is older and is less likely to survive the winter. Don’t fertilize when planting but keep them well watered especially as the weather warms. After a few weeks fertilize regularly at 3-4 week intervals. 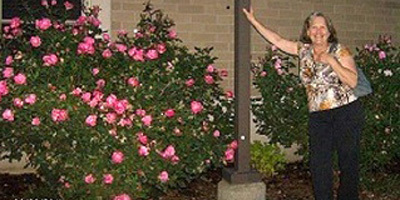 Low nitrogen fertilizers are best to encourage blooming. Several of us bought Panolas. We will see how they stand up to growing conditions in our area and keep you posted. Just a follow-up evaluation of this plant. It was planted in a large outdoor pot with a black viola of unknown pedigree. The viola flowered all summer and spread to a diameter of at least 2 feet. A petunia tucked in the pot to add some contrast when the Panola stopped blooming also did well. The Panola quit blooming after a few weeks and disappeared shortly thereafter. Our summer was not particularly warm and the pot got only morning and early afternoon sun. I was not impressed.